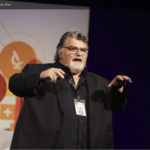 I’ve spoken on awake intubationat the EMCORE Conferences, especially at the last Masterclass. I also spoke about the potential benefits of intubating patients in the ramped positionie., head of the bed up at 25-30 degrees. Mostly this is based Off studies, using operating theatre patients that have already been intubated, then disconnected from oxygen sources and observed to see how long it took for them to desaturate. It is also based on the intubation in obesity literature. My push is to maximise everything I can, especially in the sickest patients. The problem is, that the sickest patients are often removed from these studies. The operating theatre studies and obesity studies showed that the ramped patients took longer to desaturate and intubation was made easier. A new study has came along that looks at this very question of which is better, the ‘sniffing’ position or the ‘ramped’ position and its findings do not support anything that has come before it. But does it really answer the question? Let’s take a look. This was an ICU study of 260 patients. They compared the ramped position ie at 25 degrees head up, with the sniffing position(ie flat). Those in the sniffing position, lay on a flat bed, with blankets used to slightly extend the head relative to the neck. The primary outcome was the lowest arterial oxygen saturation reached between induction and 2 minutes post intubation. They found that there was no difference between the two groups in terms of lowest arterial oxygen saturations possible. This is interesting as we would instinctively expect those patients sitting up to have greater number of alveoli available. In the operating theatre studies, patients with significant cardiopulmonary disease were excluded. It was an ICU study, so different to the operating room studies and may not apply to emergency medicine. The treating clinician felt that a specific patient position was required for the safe performance of the procedure. There does not appear to be any protocol for pre-oxygenation, which differs from the obesity studies etc where there was rigorous pre-oxygenation. 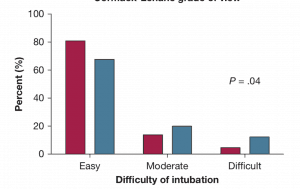 The doctors intubating had different levels of experience. Those in the anaesthetic studies were senior anaesthetists, whereas in the Semler study, 30 different clinicians intubated with varying but lesser experience. 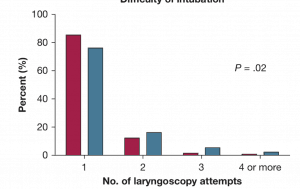 Also, those intubating here may not have been (and probably weren’t) experienced in intubating in the ramped position. Will it change my practice? Probably not, although I will think more about it in the future. In terms of having the patient sitting up as much as possible whilst they are pre-oxygenated, to maximise functional residual capacity…. I’ll certainly keep doing that. I’ll have more to say on this at EMCORE MELBOURNE. including my approach to these really sick patients and their preparation and approach to what I think is a safer intubation method.